DVD includes a one-hour video presentation and three thirty-minute audio lectures. Video presentation contains a review of the cult problem, its history, a detailed explanation of cult "brainwashing" techniques and the "warning signs" of cult involvement. The most frequently asked questions about cults and cult involvement. Cults: An Educational Volume" originally released in 2001 as a VHS video with accompanying audiocassettes has now been re-released as a single DVD. Rick Ross is an internationally known expert regarding radical, extreme and often unsafe groups--some that have been called "cults." Since 1982 he has been involved in hundreds of interventions in an effort to help the victims of destructive groups. He has been qualified and accepted as an expert witness and has testified in numerous court cases across the United States concerning destructive groups and assisted law enforcement. The finest news organizations, such as Time, Newsweek, CBS, CNN and ABC News have counted on Rick Ross to provide an understanding of many dangerous groups and the techniques they often use to recruit and retain members. "For students, educators, parents, clergy and anyone else who needs to know the ins and outs of the new phenomenon of cult control. Rick Ross has done a fine job of presenting the basics in one objective, informative presentation." Authors of "Snapping: America's Epidemic of Sudden Personality Change"
"This is a very comprehensive tool to enable families, friends, students clergy and others to begin to learn about destructive groups and it is particularly timely." "Rick Ross's helpful and informative video provides useful educational tools that may assist one in distinguishing between a beneficial and a potentially destructive group or leader. Mr. Ross is to be commended for reminding us of the importance of critical thinking and the value of education in making an informed decision about involvement with a particular group or organization." Co-author with H.H. the Dalai Lama of Tibet of "The Art of Happiness"
"This cult educational video with attached material contains a wealth of information. 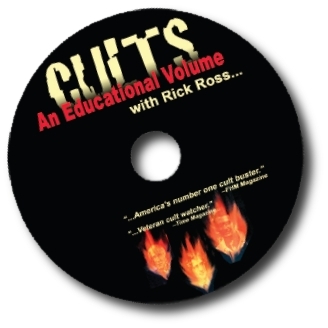 It is not only a synthesis of existing knowledge from cult experts, but also includes the extensive and invaluable first hand experience of Rick Ross--acquired through his many years of work with cult members and their families. All the material within this educational volume is presented in a way that makes it very accessible for individual use, in a classroom setting or at a meeting. Scenes reflecting many cults appear within the video and meaningful historical information is cited. The entire volume is presented effectively and professionally. I highly recommend this educational volume to a wide range of users." Author of "Cults in Our Midst"
"I feel certain you saved me from a harmful group through your DVD...Watching the DVD 'Cults: An Educational Volume' had a huge impact on me...I would like to thank you for your work and it is wonderful to see someone with integrity who is passionate about what they do."